To tell the plot of the individual stories within would be giving away too much. Like A Thousand and One Nights, each story is different, although they’re all connected to one another in terms of theme and the morals held within them. You’ll find a little bit of everything: Magic, romance, love, and even a bit of lust. You’ll find vengeful characters, characters who are innocents to the world—You’ll find characters changing genders of their own will, characters changing genders due to circumstances outside of their control, and characters toeing the line in order to discover who they really are. All of the stories carry a bit of the fantastical. Each story offers a new, different facet of the overlying theme. This lets them shine on their own accord, which is very important for me when I read an anthology. As with all groups of short stories I’ve read, I enjoyed some stories more than others. Some of the stories were edgier than I liked, supporting my opinion that this book does target supporters of the LGBT community, for all it is a good read for those of us who want to understand a bit more about the LGBT community, and don’t mind challenging our delicate sensibilities. Two of the stories I enjoyed the most were ‘The Secret Name of the Prince’ and ‘Lady Marmalade’s Special Place in Hell’—amusingly enough, the first and the last stories of the book. For those of you who are familiar with A Thousand and One Nights and the tale of Scheherazade, these two stories in particular evoked the sense that they fit well in the tales she might have told. Before I talk about my personal opinions on this book, I want to discuss a little about its publisher. Circlet Press, which is a smaller publisher of erotica, science fiction, fantasy, and futurism, welcomes the LGBT community as equals with other genre types. 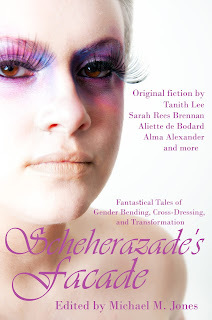 Scheherazade’s Façade came to Gressive/Circlet after a long, uphill journey. Scheherazade’s Façade opens up with an introduction about the troubles that this anthology encountered trying to find its way into print. This introduction isn’t that lengthy, but it points out an important fact: There isn’t a whole lot of acceptance for a gender bending, cross-dressing, and transformation anthology in mainstream publication. The more I thought about it, as I was starting to read, the more of an impact it—both the lack of acceptance in general of the LGBT community and the troubles getting this book into print—made on me. I’m not a member of the LGBT community. I’m a straight arrow, but I do believe, firmly, that what other people do in their bedroom is entirely up to them. I loved this book. Each story was well-written and carefully selected, carefully edited, and offered something substantial. The stories were written in such a way where, with subtle finesse, they educated. They broke the barrier between the heterosexual community and the LGBT one—at least for those with open minds. Some of the stories were shorter than others, some of them longer, but I left each one either learning something or questioning various aspects of modern society. The stories are tasteful and non-offensive. (Okay, so, someone who is very anti-LGBT is going to be offended, but the curious individual who isn’t sure what LGBT is about and wants to know? They’ll learn a lot in a pretty tame way.) These stories are a great introduction for someone like me, who doesn’t read this type of anthology often. I’ve read a decent number of lesbian and gay stories, but gender bending and transsexual stories are a niche I haven’t explored a whole lot. These stories cross all four subsets of LGBT; I found that I was able to get a glimpse of the reality of what members of this community face. I was able to experience a little of their challenges through the characters and the situations they were forced to deal with. The challenges they face might be what you’re expecting; distrust and disdain from peers, hatred, and even fear. Some of them are a bit more unexpected, dealing with the perceptions of those within the LGBT community. ‘The Secret Name of the Prince’ is one such story where the main character faces challenges expected. These stories challenged me, and challenged some of the misconceptions I have had of the community. It did so in a way that wasn’t insulting or domineering. There were some stories I just didn’t get into or didn’t like as much as others. That happens in an anthology. Not every story can be stellar for every single reader. But, even when I stumbled onto stories I just didn’t like as much, I didn’t feel like the stories were bad—they just weren’t to my specific tastes. All of the stories in this anthology were written with the pride and skill of professional authors. This is a small press book that deserves the prestige and marketing of a large press business. I’m really not sure how far this anthology will go making the rounds into the cis/heterosexual community. This book does challenge many conceptions—and misconceptions—and there are more than a few who can’t handle that sort of thing. I hope that this book goes far though, because it deserves to. An excellent review. Thank you so much for the well-written, thoughtful, and contemplative look at this anthology. It gives me a warm fuzzy feeling to know that the book made such a good impression. Sounds interesting - just bought a copy!